Well greenies I'm taking a green break to talk about one of my favorite pregnancy topics...prenatal exercise! I've set up a simple routine for staying healthy and fit this pregnancy and today I'm going to share it with you. 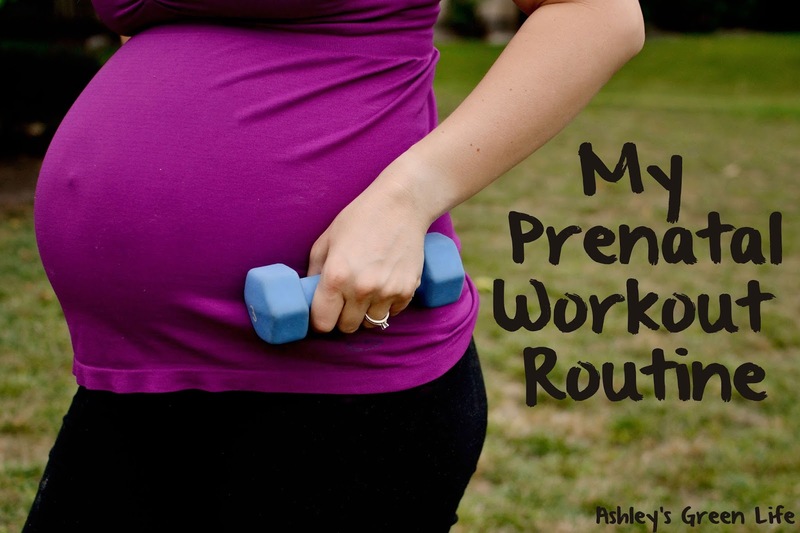 Now I've posted about my prenatal workouts before back when I was pregnant with Avery, but just as each pregnancy is different, so are my workouts. Well, not by much, since I'm a creature of habit, but I figured an update was due as to what I do NOW to stay active and healthy this pregnancy. Why workout when you're pregnant? Improving my health and that of my baby's (more oxygen and blood flowing through my body and to my baby). I also feel much more relaxed and less tense after a workout, which leads me to feel much less of the common aches and pains that come from being pregnant. Chance to strengthen my body and build endurance for labor and delivery. I had Avery naturally, here at home, so I know the work that goes into doing that and I want to do everything I can now to prepare my body to take on and succeed in that challenge when it comes in just a few short months. Make the transition back to my pre-pregnancy weight and fitness level much easier. Below you can see me 1 day after birth with Avery and then 6 months after birth. 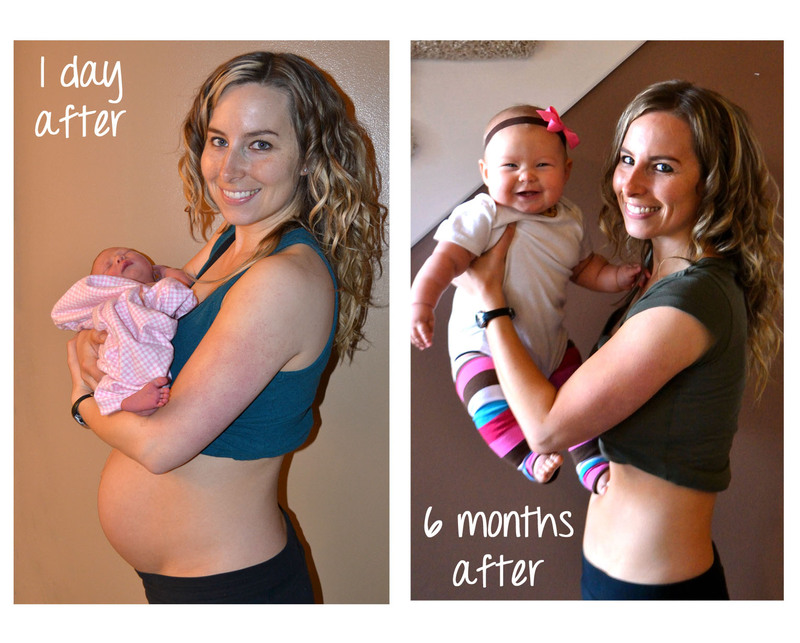 Continuing my workouts during her pregnancy helped me not only jump right back to my pre-pregnancy weight, but also lose a few more additional pounds. Read more about my "Body After Birth" journey here. I workout daily for 45 minutes to 1 hour. During the school year (I'm a teacher) I workout in the morning, before Avery wakes up. On the weekends and during the summer, I'll often workout during her nap time. Working out with a toddler is a bit challenging, so it always works better for me (and her) to just workout when she's asleep. I mainly workout in my basement. I have a treadmill (a Proform Crosswalk treadmill), a TV, and a yoga mat. Okay well, it also doubles as my office too, and sometimes a playroom for Avery, but the thing I love most about it is that it allows me to workout, without excuses, in the comfort of my own home. I have air conditioning in the summer, heat in the winter, a bathroom nearby, and if I need a snack I just head up the stairs. I don't have to drive anywhere, worry about daycare, or have my workout cancelled because of various weather conditions. I guess you could say I'm a bit high-maintenance in my workout setup, but it gives me the ability to workout every, single day....without anything getting in my way (other than a toddler who doesn't want to nap) and for me that works. Maybe gyms are your thing, or being in the great outdoors...that's great! As long as you find something that works for you and that you want to keep doing every day, then it's all good! What type of workouts do I do? As I said in the video, the most common place I get my cardio in is on my treadmill. When I mean cardio, I'm referring to walking. Before I was pregnant, I did intervals of running and walking, but since becoming pregnant, I toned it down a notch and now just walk. To keep the calorie burn up and build my endurance, I work on increasing the incline of the treadmill. An average incline for my treadmill is about 5.0 on a decent day, somedays higher and somedays lower. 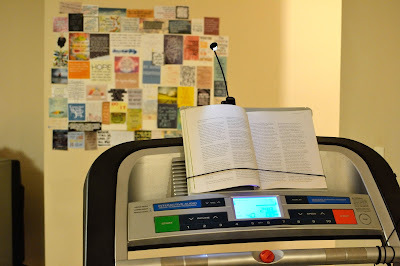 Often times when I'm walking on the treadmill I will read books (for future blog posts), watch documentaries on my TV, or even write in my planner (yeah the writing gets a little messy when you're walking at the same time, but that's okay!). As you can tell I have a quote board that I look at on the wall in front of my treadmill which I've filled with some of my favorite quotes from Pinterest. These quotes give me inspiration to make it through my workout and some I even keep in my mind as I go about my day. Read more about my quote board here. My treadmill set up (quote board included). 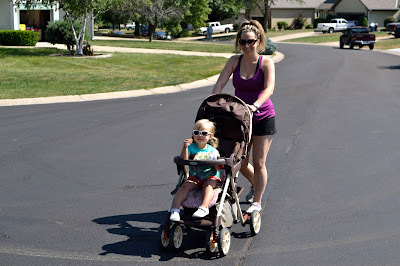 Now since I've been off for summer break from my teaching job, and the weather is nice here in the Midwest I take my cardio outdoors and go for a walk around our neighborhood with Avery. Our walks last about an hour still. Not only do we get to soak up a little sunshine, it leads to great conversations between her and I about nature, and it's nice to mix up my cardio workout a bit. I also utilize outdoor walks with Avery during the school year, but just on the weekends. 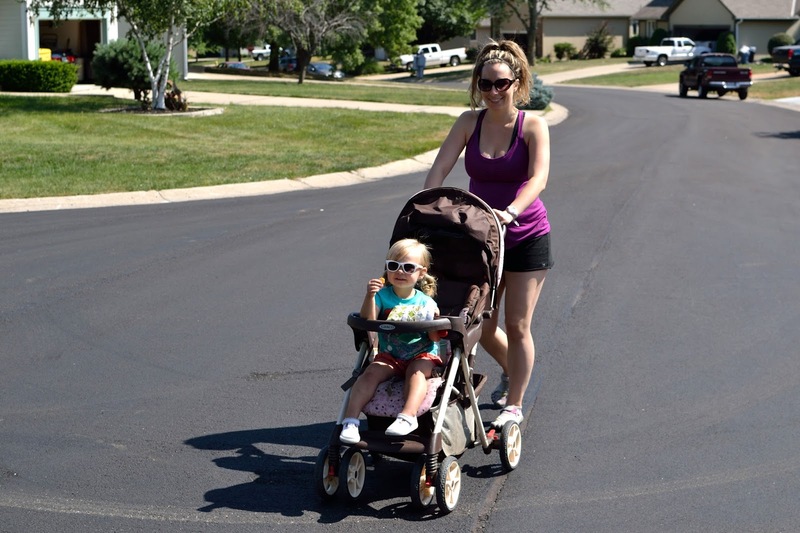 These walks are also great for when I've worked through one of her naps and now realize I'm stuck trying to workout with a toddler! But it's no worries here, Avery will glad hop in the stroller, and off we go! I just have to make sure and pack her some snacks and a drink and then we're all set. I guess I should probably look into a double stroller for when Mila arrives! The next type of workout I do is pilates. 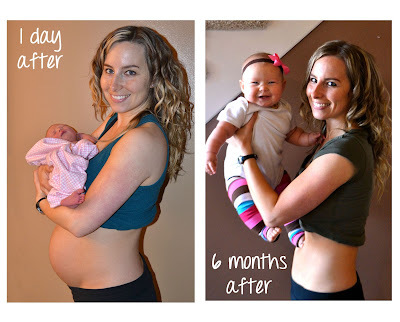 I discovered pilates in my pregnancy with Avery and I love it! It's a bit like yoga/dance/stretching/strength training...it's awesome. You can read about some of my favorite pilates DVDs that I like to do when I'm not pregnant, here and I swear they really helped me get back to my pre-pregnancy weight once Avery was born. 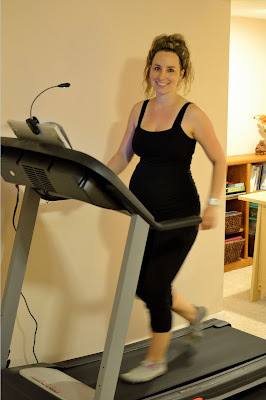 With this pregnancy, I was getting a little bored with just that pilates DVD so I gave Suzanne Bowen's Slim & Toned Prenatal Barre Workout a try and I fell in love. I used to do Suzanne Bowen's 10 Minute Solutions Pilates Perfect Body DVD before I was pregnant, and so I was happy to try using her as an instructor again....isn't funny how I talk about her like I was in a real class with her? Nope just a virtual class through my TV! And just as with that DVD, this prenatal workout DVD seemed simple enough as I was going along, but afterwards I was sore for days! So if you're going to try this DVD be sure to EASE IN to doing it. "The method is influenced by classical and modern dance (though it is not a dance class) and utilizes a barre to achieve optimal positioning. Insights from Pilates, yoga, and orthopedic stretching also balance the method’s unique approach." So even though it's not a true "pilates" workout it does emphasize some pilates techniques, which is why I include it on this "Pilates day". What I love about this DVD is that it incorporates small movements (like a ballet-type squat and which you do over and over and over again) and it seems easy in the beginning, it seems easy. But after awhile you start to feel the burn and start to shake, and boy do you feel it the next day! This is one tough workout, but I love how I feel after doing it. This brings us to the last day of my workout routine, my yoga day. I love yoga and aside from being a great workout it helps me to relax and stretch my muscles...a must when you're pregnant. I've tried tons of prenatal yoga DVDs between this pregnancy and Avery's pregnancy, and many of them were so slow and boring that I was practically falling asleep! Let's get our "yoga on" Mila! But I struck gold when I found The Divine Mother Prenatal Yoga Series by Anna Getty. It's the perfect balance between taking it easy and challenging yourself. The first time I did this DVD during Avery's pregnancy, I felt like it was geared perfectly for a pregnant mom. Not only did it gently work and stretch the areas I feel the most discomfort in (back, neck, low abdomen), it also helped me feel much more connected to my baby! I highly recommend this one. The only trouble is the that the DVD I linked on Amazon, in a used condition costs around $38! Not sure why it's so expensive other than the fact that they aren't making it anymore or something, but you might try finding it on Netflix if you have that other another used DVD website. Now obviously, I don't stick to this routine completely. Sometimes it will be a treadmill day and I just feel like doing yoga, or maybe it will be a nice day so I'll take Avery out for a walk instead of doing pilates ..and that's okay! I give myself some wiggle room with my schedule and follow what feels best for my body (and my mood). I just try to get a good variety of the three types of workouts in my workout routine that week, and as long as I do that, I feel good. So there you have it, my prenatal workout routine! If you have any questions feel free to ask them below or if you have a favorite type of workout or workout DVD that you did or are currently doing while pregnant you can share that too!